The reason why Fascism spread in Italy were the dissatisfaction with the peace agreements after the I World War as well as the effects of the crisis: inflation and unemployment. 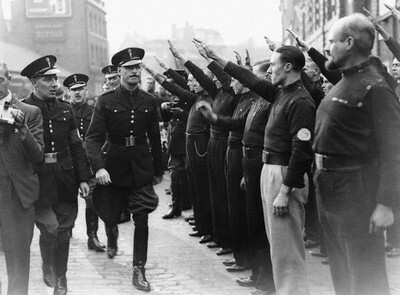 Fascism was created by Benito Mussolini when he founded the National Fascist Party using paramilitary groups (Black shirts) to crush the working class. Middle classes (landlords, small bourgeoisie) the Church and king Victor Emmanuel III supported fascism. In 1922, Mussolini claimed power after combating strikes so he organized the March on Rome with the Blackshirts. He was appointed prime minister by the king. After reaching power, Mussolini controlled the country and extinguished opposition with the help of the secret police OVRA, political parties were forbidden as well as trade unions, planned economy and propaganda and censorship contributed to his leadership and reputation.